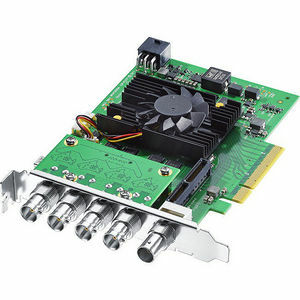 The ultimate digital cinema capture card! DeckLink 8K Pro features four quad link 12G-SDI connections and works in all SD, HD, Ultra HD, 4K and 8K DCI frame sizes. You get support for 8 and 10-bit YUV 4:2:2, as well as 10 and 12-bit RGB 4:4:4 with full Rec. 2020 color. In addition, you can work at up to 60 frames per second in HD, 4K and 8K. The four 12G-SDI connections support 16 channels of embedded audio each, for a total of 64 channels. DeckLink 8K Pro is perfect for the next generation of high resolution, high frame rate and high dynamic range workflows!